What psychosis type of this patient? 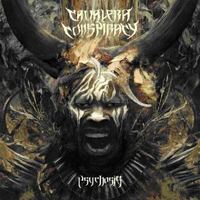 Intro and verse plunges into the darkness of an unrestrained drive, the chorus says that it is just Insane starts Cavalera Conspiracy - Psychosis album in such unrestrained burst of rage. The instrumental part in some way goes into the plane of the gloomy melody, giving a dimmed thoughtfulness some kind of dark charm. The rapid unrestrained Terror Tactics beginning and later music in instrumental high-speed passages supports vocal reflections with a furious drive. Again, the instrumental part introduces a shade of mystery and mythical invisible ghosts, supplementing with the echoes of their presence the ending of the composition, which goes through a combination of pensive musical and vocal revelations. In the same enigmatic horror as the end of previosu track, the foreboding of the anticipation of the horrors to come, the mid-tempo march Impalement Execution passes, in a gloomy reverie, shackles the thoughts with rusty shackles. But before the instrumental part, a furious leap rushes to the light and freedom in the stream of unrestrained drive. But a few thoughtful phrases and a screech of torture mechanisms complete the composition, anticipating the introduction of the next. Mythical darkness embraces the Spectral War story with power and dusk of the musical component, in bridges sweeping the whirlwind of guitar passages. Mysterious guitar parts pierce the sound and sometimes swirl over the sound image with bright sparkles. The ending carries dark fairy tales into fairy-tale spaces, completing the composition with magical black mysticism, which continue to develop their non-fiction art into the Crom introduction. Completing the muted fog of shamanic rituals with tambourines and obscure rituals with wind noise, the music first presents a bright unforgettable guitar solo, then a powerful stream of unrestrained drive that rushes to catch sharp vocal phrases. Vocals thicken their harsh style almost to growling. In the instrumental part, distorted words of mysterious ghosts and phrases of pure vocals again bring back the gloomy fog, completing the composition in an atmosphere of obscure mystery and wise prophecies. Drumming and muffled obscure words on the background begin Hellfire with eerie march of demonic guardians. Then demonic warlord directs this procession striving to create evil, terror and unavoidable destruction in the hellfire of wars, plagues and unexplained natural disasters. After restrained, shackled horrors and inexplicable evil Judas Pariah picks up the pace to a frenzied drive, a solo guitar carries a mysterious fairy atmosphere in rapid passages over the rest of the musical image But the horrified march on Golgotha in the instrumental part returns a restrained atmosphere of enchanting dusk and black tales. The title track instrumental saga Psychosis introduces the enchanting atmosphere of progressive art rock, in this meditative musical artwork combining shamanic rituals, oriental motifs and gothic romance. Starting with a fast, uncontrollable stream of furious drive, Excruciating then turns into mysterious mythical rituals, completing the composition and the whole album with the mystic dusk of mysterious fairy tales.